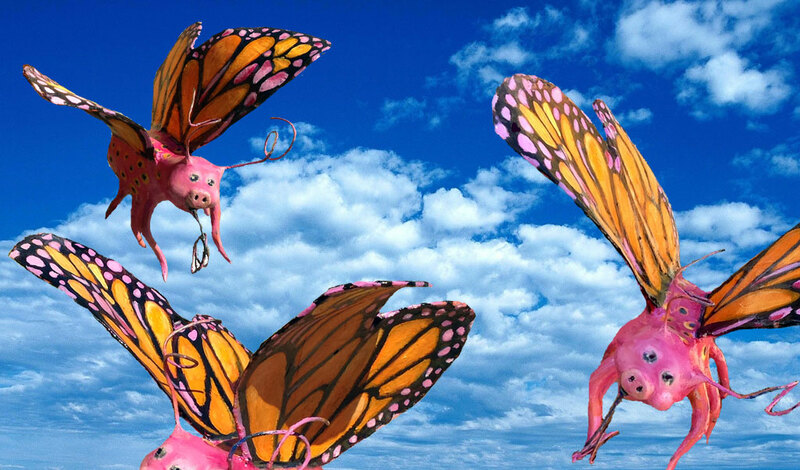 Monsanto Gardens introduces Monarch Butter Pig (Danaus piggypus), just in time for the arrival of Monarch butterflies in their overwintering forest in Mexico. Except hardly any are showing up for their annual Dia De Los Muertos celebration. I guess they are just plain dead. As you already know, monarch butterfly populations have plummeted since the wide-spread use of our patented weed killer RoundUp on our RoundUp-ready corn and soybean crops in the midwest. Milkweed is a weed, after all. And those picky monarch caterpillars *only* eat milkweed. Sorry about that. Not to worry! Science has a solution! Monsanto Gardens patented Monarch Butter Pig is immune to both RoundUp and Dow’s Enlist Duo, and I daresay, the beautiful Monarch Butter Pig is not only indestructible, it’s more beautiful than its un-genetically modified brethren. The Monarch Butter Pig is the second pig-insect introduced by Monsanto Gardens. It is good friends with Bumble Pig (our first). The Brits have a GMO mosquito, but it’s not cute.